Forced to work in her boarding house, looking after the guests, sharpening the thorns of every plant in the poisonous plant garden and listening to off-key renditions of ‘Fish Are Friends Too’ - an aria made famous by the legendary Magnus Montgomery - Whimsy and Woe lose all hope that their parents will someday return. Until one day, quite by accident, the siblings stumble upon a half-charred letter that sets them on a course to freedom and finding their parents. Reading this book, I felt like a child immersed in a good old-fashioned stage melodrama, barracking for the dauntless Whimsy and Woe and heckling the fiendish villains; through the magic of this story I relived the rapture of childhood. 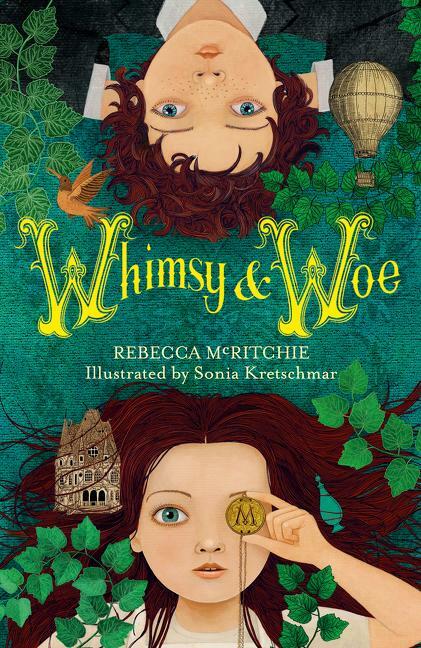 Whimsy and Woe has it all: incredibly courageous children (hooray! ), an evil calculating aunt, the ignominious Ignatius Solt (boo!) and a despicable one-legged pirate (hiss! ), captivity and misery in a boarding house populated by an outlandish clientele (gasp!) and a heroic escape from a treacherous storm, imprisonment in a swamp and a wolf with razor-sharp teeth … all told with vivid thespian style and flair. Fiercely determined to rescue their kidnapped parents, the heroic sister-and-brother team of Whimsy and Woe refuse to wallow in self-pity, harnessing their wits to perfect the art of the bluff and decision-making on the run, while narrowly escaping the clutches of their persecutors. If A Series of Unfortunate Events and Withering by Sea produced a love child – this would be it! This very handsomely illustrated hardback book is the first of two books and I can’t wait to find out what happens in the sequel! It’s perfect for independent readers nine years and up who love mystery adventures and an ideal read-aloud story for the whole family.